2.2.3. Activations, Agenda and Conflict Sets. So where do we get started, there are so many use cases and so much functionality in a rule engine such as Drools that it becomes beguiling. Have no fear my intrepid adventurer, the complexity is layered and you can ease yourself into with simple use cases. Is this person eligible for a mortgage? Filter incoming messages, such as emails, into folders. Send incoming messages to a destination. So let's start with a very simple example using a driving license application. Now that we have our data model we can write our first rule. We assume that the application uses rules to refute invalid applications. As this is a simple validation use case we will add a single rule to disqualify any applicant younger than 18. To make the engine aware of data, so it can be processed against the rules, we have to insert the data, much like with a database. When the Applicant instance is inserted into the engine it is evaluated against the constraints of the rules, in this case just two constraints for one rule. We say two because the type Applicant is the first object type constraint, and age < 18 is the second field constraint. An object type constraint plus its zero or more field constraints is referred to as a pattern. When an inserted instance satisfies both the object type constraint and all the field constraints, it is said to be matched. The $a is a binding variable which permits us to reference the matched object in the consequence. There its properties can be updated. The dollar character ('$') is optional, but it helps to differentiate variable names from field names. The process of matching patterns against the inserted data is, not surprisingly, often referred to as pattern matching. Let's assume that the rules are in the same folder as the classes, so we can use the classpath resource loader to build our first KnowledgeBase. A Knowledge Base is what we call our collection of compiled definitions, such as rules and processes, which are compiled using the KnowledgeBuilder. Both the KnowledgeBuilder and KnowledgeBase can be created from the factories KnowledeBuilderFactory and KnowledgeBaseFactory. The preceding code executes the data against the rules. Since the applicant is under the age of 18, the application is marked as invalid. So far we've only used a single instance, but what if we want to use more than one? We can execute against any object implementing Iterable, such as a collection. Let's add another class called Application, which has the date of the application, and we'll also move the boolean valid field to the Application class. We can also add another rule to validate that the application was made within a period of time. rule "Application was made this year"
Unfortunately a Java array does not implement the Iterable interface, so we have to use the JDK converter method Arrays.asList(...). The code shown below executes against an iterable list, where all collection elements are inserted before any matched rules are fired. The two execute methods execute(Object object) and execute(Iterable objects) are actually convenience methods for the interface BatchExecutor's method execute(Command command). Batch Executor and Command Factory are particularly useful when working with multiple Commands and with output identifiers for obtaining results. CommandFactory supports many other Commands that can be used in the BatchExecutor like StartProcess, Query, and SetGlobal. Stock market monitoring and analysis for semi-automatic buying. In contrast to a Stateless Session, the dispose() method must be called afterwards to ensure there are no memory leaks, as the Knowledge Base contains references to Stateful Knowledge Sessions when they are created. StatefulKnowledgeSession also supports the BatchExecutor interface, like StatelessKnowledgeSession, the only difference being that the FireAllRules command is not automatically called at the end for a Stateful Session. We illustrate the monitoring use case with an example for raising a fire alarm. Using just four classes, we represent rooms in a house, each of which has one sprinkler. If a fire starts in a room, we represent that with a single Fire instance. In the previous section on Stateless Sessions the concepts of inserting and matching against data was introduced. That example assumed that only a single instance of each object type was ever inserted and thus only used literal constraints. However, a house has many rooms, so rules must express relationships between objects, such as a sprinkler being in a certain room. This is best done by using a binding variable as a constraint in a pattern. This "join" process results in what is called cross products, which are covered in the next section. When a fire occurs an instance of the Fire class is created, for that room, and inserted into the session. The rule uses a binding on the room field of the Fire object to constrain matching to the sprinkler for that room, which is currently off. When this rule fires and the consequence is executed the sprinkler is turned on. Whereas the Stateless Session uses standard Java syntax to modify a field, in the above rule we use the modify statement, which acts as a sort of "with" statement. It may contain a series of comma separated Java expressions, i.e., calls to setters of the object selected by the modify statement's control expression. This modifies the data, and makes the engine aware of those changes so it can reason over them once more. This process is called inference, and it's essential for the working of a Stateful Session. Stateless Sessions typically do not use inference, so the engine does not need to be aware of changes to data. Inference can also be turned off explicitly by using the sequential mode. So far we have rules that tell us when matching data exists, but what about when it does not exist? How do we determine that a fire has been extinguished, i.e., that there isn't a Fire object any more? Previously the constraints have been sentences according to Propositional Logic, where the engine is constraining against individual intances. Drools also has support for First Order Logic that allows you to look at sets of data. A pattern under the keyword not matches when something does not exist. The rule given below turns the sprinkler off as soon as the fire in that room has disappeared. While there is one sprinkler per room, there is just a single alarm for the building. An Alarm object is created when a fire occurs, but only one Alarm is needed for the entire building, no matter how many fires occur. Previously not was introduced to match the absence of a fact; now we use its complement exists which matches for one or more instances of some category. Likewise, when there are no fires we want to remove the alarm, so the not keyword can be used again. Finally there is a general health status message that is printed when the application first starts and after the alarm is removed and all sprinklers have been turned off. The above rules should be placed in a single DRL file and saved to some directory on the classpath and using the file name fireAlarm.drl, as in the Stateless Session example. We can then build a Knowledge Base, as before, just using the new name fireAlarm.drl. The difference is that this time we create a Stateful Session from the Knowledge Base, whereas before we created a Stateless Session. With the session created it is now possible to iteratvely work with it over time. Four Room objects are created and inserted, as well as one Sprinkler object for each room. At this point the engine has done all of its matching, but no rules have fired yet. Calling ksession.fireAllRules() allows the matched rules to fire, but without a fire that will just produce the health message. We now create two fires and insert them; this time a reference is kept for the returned FactHandle. A Fact Handle is an internal engine reference to the inserted instance and allows instances to be retracted or modified at a later point in time. With the fires now in the engine, once fireAllRules() is called, the alarm is raised and the respective sprinklers are turned on. After a while the fires will be put out and the Fire instances are retracted. This results in the sprinklers being turned off, the alarm being cancelled, and eventually the health message is printed again. Everyone still with me? That wasn't so hard and already I'm hoping you can start to see the value and power of a declarative rule system. People often confuse methods and rules, and new rule users regular ask, "How do I call a rule?" After the last section, you are now feeling like a rule expert and the answer to that is obvious, but let's summarize the differences nonetheless. One call results in a single execution. Rules execute by matching against any data as long it is inserted into the engine. Rules can never be called directly. Specific instances cannot be passed to a rule. Depending on the matches, a rule may fire once or several times, or not at all. These cross products can obviously become huge, and they may very well contain spurious data. The size of cross products is often the source of performance problems for new rule authors. From this it can be seen that it's always desirable to constrain the cross products, which is done with the variable constraint. This results in just four rows of data, with the correct Sprinkler for each Room. In SQL (actually HQL) the corresponding query would be select * from Room, Sprinkler where Room == Sprinkler.room. So far the data and the matching process has been simple and small. To mix things up a bit a new example will be explored that handles cashflow calculations over date periods. The state of the engine will be illustratively shown at key stages to help get a better understanding of what is actually going on under the hood. Three classes will be used, as shown below. By now you already know how to create Knowledge Bases and how to instantiate facts to populate the StatefulKnowledgeSession, so tables will be used to show the state of the inserted data, as it makes things clearer for illustration purposes. The tables below show that a single fact was inserted for the Account. Also inserted are a series of debits and credits as CashFlow objects for that account, extending over two quarters. Two rules can be used to determine the debit and credit for that quarter and update the Account balance. The two rules below constrain the cashflows for an account for a given time period. Notice the "&&" which use short cut syntax to avoid repeating the field name twice. rule "increase balance for credits"
rule "decrease balance for debits"
If the AccountPeriod is set to the first quarter we constrain the rule "increase balance for credits" to fire on two rows of data and "decrease balance for debits" to act on one row of data. The two cashflow tables above represent the matched data for the two rules. The data is matched during the insertion stage and, as you discovered in the previous chapter, does not fire straight away, but only after fireAllRules() is called. Meanwhile, the rule plus its matched data is placed on the Agenda and referred to as an Activation. The Agenda is a table of Activations that are able to fire and have their consequences executed, as soon as fireAllRules() is called. Activations on the Agenda are executed in turn. Notice that the order of execution so far is considered arbitrary. After all of the above activations are fired, the account has a balance of -25. If the AccountPeriod is updated to the second quarter, we have just a single matched row of data, and thus just a single Activation on the Agenda. The firing of that Activation results in a balance of 25. What if you don't want the order of Activation execution to be arbitrary? When there is one or more Activations on the Agenda they are said to be in conflict, and a conflict resolver strategy is used to determine the order of execution. At the simplest level the default strategy uses salience to determine rule priority. Each rule has a default value of 0, the higher the value the higher the priority. To illustrate this we add a rule to print the account balance, where we want this rule to be executed after all the debits and credits have been applied for all accounts. We achieve this by assigning a negative salience to this rule so that it fires after all rules with the default salience 0.
rule "Print balance for AccountPeriod"
The table below depicts the resulting Agenda. The three debit and credit rules are shown to be in arbitrary order, while the print rule is ranked last, to execute afterwards. Drools also features ruleflow-group attributes which allows workflow diagrams to declaratively specify when rules are allowed to fire. The screenshot below is taken from Eclipse using the Drools plugin. 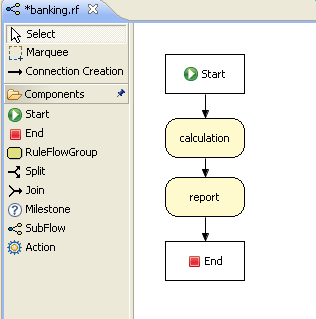 It has two ruleflow-group nodes which ensures that the calculation rules are executed before the reporting rules. The use of the ruleflow-group attribute in a rule is shown below. Inference has a bad names these days, as something not relevant to business use cases and just too complicated to be useful. It is true that contrived and complicated examples occur with inference, but that should not detract from the fact that simple and useful ones exist too. But more than this, correct use of inference can crate more agile and less error prone businesses with easier to maintain software. So what is inference? Something is inferred when we gain knowledge of something from using previous knowledge. For example given a Person fact with an age field and a rule that provides age policy control, we can infer whether a Person is an adult or a child and act on this. So now we know what inference is, and have a basic example, how does this facilitate good rule design and maintenance? However the ID department does not set the policy on who an adult is. That's done at a central government level. If the central government where to change that age to 21 there is a change management process. Someone has to liaise with the ID department and make sure their systems are updated, in time for the law going live. This change management process and communication between departments is not ideal for an agile environment and change become costly and error prone. Also the card department is managing more information than it needs to be aware of with its "monolothic" approach to rules management which is "leaking" information better placed else where. By this I mean that it doesn't care what explicit "age >= 18" information determines whether someone is an adult, only that they are an adult. Instead what if we were to split (de-couple) the authoring responsibility, so the central government maintains its rules and the ID department maintains its. While the example is very minimal and trivial it illustrates some important points. We started with a monolithic and leaky approach to our knowledge engineering. We create a single decision table that had all possible information in it that leaks information from central government that the ID department did not care about and did not want to manage. We first de-coupled the knowledge process so each department was responsible for only what it needed to know. We then encapsulated this leaky knowledge using an inferred fact IsAdult. The use of the term IsAdult also gave a semantic abstraction to the previously arbitrary logic "age >= 18". So far, the programmatic API has been used to build a Knowledge Base. Quite often it's more desirable to do this via configuration. To facilitate this, Drools supports the "Changeset" feature. The file changeset.xml contains a list of resources, and it may also point recursively to another changeset XML file. Currently there is no XML schema for the changeset XML, but we hope to add one soon. A few examples will be shown to give you the gist of things. A resource approach is employed that uses a prefix to indicate the protocol. All the protocols provided by java.net.URL, such as "file" and "http", are supported, as well as an additional "classpath". Currently the type attribute must always be specified for a resource, as it is not inferred from the file name extension. Here is a simple example that points to a http location for some rules. To use the above XML, the code is almost identical as before, except we change the resource type to CHANGE_SET. Changesets can include any number of resources, and they even support additional configuration information, which currently is only needed for decision tables. The example below is expanded to load the rules from a http URL location, and an Excel decision table from the classpath. It is also possible to specify a directory, to add the contents of that directory. It is expected that all the files are of the specified type, since type is not yet inferred from the file name extensions. The Knowlege Agent provides automatic loading, caching and re-loading of resources and is configured from a properties files. The Knowledge Agent can update or rebuild this Knowlege Base as the resources it uses are changed. The strategy for this is determined by the configuration given to the factory, but it is typically pull-based using regular polling. We hope to add push-based updates and rebuilds in future versions. A KnowledgeAgent object will continuously scan all the added resources, using a default polling interval of 60 seconds and, when some last modification date is updated, it will applied the changes into the cached Knowledge Base using the new resources. Note that the previous KnowledgeBase reference will still exist and you'll have to call getKnowledgeBase() to access the newly built KnowledgeBase. If a directory is specified as part of the change set, the entire contents of that directory will be scanned for changes. The way modifications are applied depends on drools.agent.newInstance property present in the KnowledgeAgentConfiguration object passed to the agent. Because Knowledge Agent could scan and process remote resources, it could ends up failing when compiling or executing rules, queries, functions, etc. that use classes outside the agent's classloader. If this is your case, you could take 2 approach: use a custom classloader for agent's kbuilder or force the agent to use the same classloader that its kbase has. Knowledge Agent uses KnowledgeBuilder internally in order to compile managed resources. If you need to pass custom configuration to these compilers you could pass a KnowledgeBuilderConfiguration object to KnowledgeAgentFactory.newKnowledgeAgent(). This object will be used in every builder the agent creates. Using a KnowledgeBuilderConfiguration you can specify a custom classloader. Most of the times, the classloader you wan't to use in the compilation process of remote resources is the same needed in the agent's kbase, so the rules could be executed. If you want to use this approach, you will need to setup the desired ClassLoader to the agen't kbase and use the "drools.agent.useKBaseClassLoaderForCompiling" property of KnowledgeAgentConfiguration object. This approach lets you modify agent's kbuilder classloader in runtime by modifying the classloader the agent's kbase uses. This will serve also when not using incremental change set processing (see the section below). When the kbase is recreated its configuration is reused, so the classloader is maintained. Knowledge Agent can process change sets in two different ways: recreating the knowledge base every time a new change set is processed or applying the change set in the cached knowledge base without destroying it. This behavior is controlled by the "newInstance" property of the KnowledgeAgentConfiguration object passed to the Agent's constructor. When "newInstace" is set to true (the default value), the agent will destroy the cached Knowledge Base it contains and populate a new one containing the change set modifications. When "newInstance" is set to "false" change sets are applied directly to the cached Knowledge Base. The rule that were not modified in the change sets' resources are not replaced in the Knowledge Base, the modified or deleted rules are modified or deleted from the cached Knowledge Base. Functions, Queries and Definition Types are always replaced in the cached Knowledge Base whether they are modified or not. A note on remote HTTP Url Resources: if your knowledge agent is "pulling" resources from a http(s) URL, then you might rightly be concerned if that resource (remote web server) suddenly disappears. To survive a restart when a resource is no longer available remotely (eg the remote server is being restarted) then you can set a System Property: drools.resource.urlcache to a directory that has write permissions for the application: the Knowledge Agent will cache copies of the remote resources in that local directory. For example, using the java command line: -Ddrools.resource.urlcache=/users/someone/KnowledgeCache - will keep local copies of the resources (rules, packages etc) in that directory, for the agent to use should it be restarted (when a remote resource becomes available, and is updated, it will automatically update the local cache copy).